A Loss Of Sight, Never A Loss Of Vision! Children wit﻿h visual impairments have been shown to have lower levels of health-related physical fitness than their peers. Camp Abilities Tucson strives in reinforcing each child’s self-esteem and confidence in their ability to master specific sports, recreational and social activities. These are often overlooked in the education and home environment and Camp Abilities Tucson may be the only opportunity some of these children have to participate in athletic activities. Athletes orient themselves to the goalball court. Goalball is a sport designed for blind athletes. The sport is played 3v3 on a court marked out with taped rope and a goal at each end. 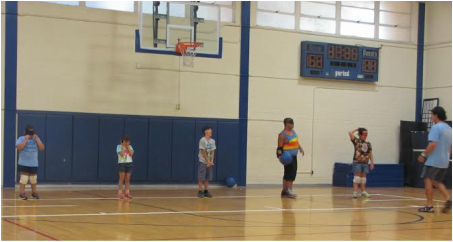 The objective of the game is to roll an auditory 12-inch ball across the 18 meter court past the opposing team. The opposing team uses their bodies to block the ball and roll it back attempting to score. Goalball encourages athletes to use their orientation and sensory efficiency skills, as well as work as a team. Beep Baseball is a sport for athletes who are blind or visually impaired. Six outfielders are on the field at a time. To score, the offense has to reach a base before the outfielders retrieve the ball. 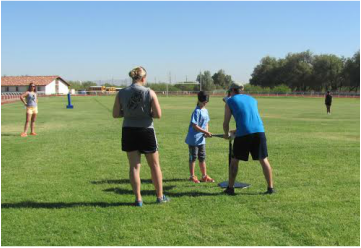 At Camp Abilities Tucson, we instruct athletes in hitting, base running, and fielding, as well as general techniques and strategies of the game. An athlete prepares to hit the ball as two coaches provide feedback. Athletes receive instruction from their coaches in the pool. Every dat at camp, we jump in the pool to cool off, relax, and develop our swim skills. At Camp Abilities Tucson, we train all our athletes, from beginner swimmers to advanced swimmers. Our goal is to help athletes build endurance while also developing their stroke skills. Tandem cycling is both a Paralympic sport on its own, and a leg of the ParaTriathlon. At CAPA, we coach athletes on how to be a "stoker", the rider on the back of a tandem bike, and work as a team with their pilot. We offer a variety of Paralympic style and developmental tandem bikes. An athlete and coach ride around the track on a tandem bike. A coach instructs a group of athletes on proper discus throwing form. Field events are components of the track and field program in which athletes can compete independently on their school and community teams. During the throwing activities at camp, the athletes have exposure to shot put, discus, and javelin accompanied by technical form training in order to help them achieve their longest distance using their best form. At the end of the week, athletes compete in a Personal Record Challenge to try to beat their best throws from the week. Strength training is a lifetime physical activity that contributes to success in other sports, as well as muscular strength and endurance. Athletes learn proper form to deadlift a bar, throw medicine balls, and pull/ pushed heavy sleds. At the end of the week, athletes compete in a Personal Record Challenge to try to beat their best throws from the week. Coach assists an athlete in maintaining proper form while deadlifting a bar before adding weights. An athlete works on driving the ball while a coach gives feedback. 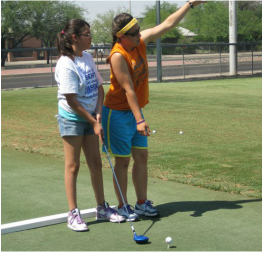 With the help of awesome community partners, Camp Abilities Tucson takes off campus trips, such as to The First Tee of Tucson. Golf at camp includes instruction in driving, putting, and chipping techniques, as well as general knowledge of the game. ​Another outing camp takes is to the bowling alley. Athletes and coaches socialize and learn to bowl in a fun environment. Athletes are taught bowling scoring and proper form to throw the ball. A coach assists an athlete in picking a bowling ball. Being an athlete is about more than just playing sports; it is about working as a team. At Camp Abilities Tucson, athletes and coaches learn to be members of a team to play, compete, and work towards a common goal. Coaches and athletes cheer one another on before tournament day. Coaches and athletes form a conga line while the Accordion Club of Tucson plays. Athletes high five after a game of beep baseball.